QUANTITY – That is, listening to and reading a LOT of content. QUALITY – Choosing content that is interesting, engaging and challenging but still suitable for your current level of knowledge. That’s literally thousands of hours of content which, if tackled systematically and mastered, would provide a solid base of Japanese proficiency. So it’s double thumbs up on the quantity front. How about quality? This is perhaps subjective, but the lessons I listened to were professional and engaging. Certainly much better than your average Japanese audio course. There was clearly a lot of love and effort put into the content. In short, the resources provided are very thorough. With so many incomplete courses out there, it’s nice to see a provider that cares about its audience and covers all the possible bases. To aid you in mastering Japanese vocabulary, various useful features such as flashcards, common wordlists, and even a Japanese dictionary are included among others These are all nice to have and provide a good way of reviewing what you’ve learned in the lessons. JapanesePod101 is great for building up your passive vocabulary and getting used to hearing the language spoken naturally. What it won’t give you is improved speaking proficiency. At least not immediately. For that you need to actually speak the language with friends or, better, a private tutor. 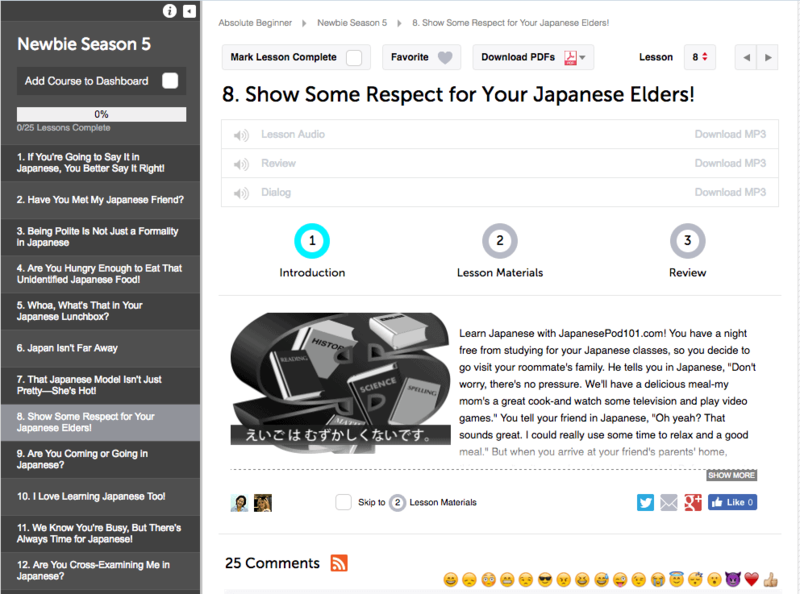 JapanesePod doesn’t provide this with a basic subscription but the premium membership does include 1-1 teaching time. I’m of the opinion that learning to speak Japanese doesn’t need to be rushed. This goes for double if you’re a beginner-intermediate learner and don’t live in Japan yet. Focus on building up your passive knowledge first, which will give you a wider vocabulary and overall grasp of the language. Once you are understanding a fair amount of the dialogues, you can upgrade your membership or jump online and hire a private tutor to get some practice hours in. But only when you are ready. Far too many people go too quickly, perhaps feeling obligated to start speaking immediately. Although JapanesePod provides extremely thorough lesson notes and introduces new kanji systematically, you’ll still need a grounding in the kanji to get the basics down before these notes are useful. There are a number of ways to achieve this, but studying on your own will produce faster results than any offline Japanese class. I personally recommend the Heisig Approach (previously covered in this article) to get to grips with the kanji. Even if you don’t fully master all 2000 of the commonly used characters, the Heisig course will get you comfortable with the radicals and general concept of kanji. JapanesePod101 is a solid resource for those of you who want a complete resource for spoken Japanese. The language used is both authentic and natural. I certainly would have made even faster progress with my studies if I’d had this course back when I started learning Japanese! Highly recommended. 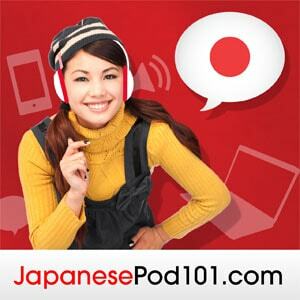 Have you used JapanesePod101 to further your own Japanese studies? How did you find it? Let us know in the comments below! Agreed. Japanese Pod is pretty solid. It has served me well so far. Looks like they’ve added a lot more advanced lessons since I last used it. It’s great for farming sentences/vocabulary from the lesson transcripts and adding them to anki. Some of the dialogue is funny, follows a narrative, and you learn a good deal about Japan too. Must get back to it in 2017. It’s not a paid review. This is a course I have checked out myself after a friend’s recommendation. It’s a solid resource for Japanese learners. The bristles consist of natural, artificial or combined filaments of special treatment, ideally selected for receiving of maximal efficient result in application of make-up. Multi-stage system of control of fabrication of brushes guarantees their highest quality and reliability. Thank to it the production has an extended service life and allows to economize the cosmetic materials.Every set of brushes contains all the necessary tools for the work of make-up artist. The high quality cases and tubes Armée Beauté facilitate a reliable keeping and carrying and comfortable use of these instruments. The highest level of our production is confirmed by the certification according to the standard ISO 9001:2008. AtravÃ©s do pro Programa SÃ³ciOnline, vocÃª tem acesso Ã fÃ³rmula testada e aprovada para construir seu negÃ³cio prÃ³prio na internet com 03 formas de ganhos muito bem detalhadas. E tudo Ã© dado de uma forma muito fÃ¡cil de entender, fazendo com que vocÃª possa comeÃ§ar a ganhar dinheiro a partir de 30 minutos. Se eu disser que este sistema Ã© abrangente, eu estaria fazendo um eufemismo.